Want to know my remedy to brighten up cold and dreary March days? A scrumptious bowl of turkey soup! Delicious and nutritious, turkey soup is the ideal meal to fuel your family and fill them up with nutrients they need for good health. Step 1: Make your own rich, flavourful turkey stock. I find that homemade turkey stock gives you a depth of flavour that you just can’t get from store-bought stock. Plus, when you use turkey parts (like legs) to make stock, you have moist, nutrient-rich turkey meat to add to your soup. As a dietitian, I like that you can control how much salt you add when you make your own stock; most commercial brands of stock are high in sodium (unless it’s a low/no-sodium stock). Use lots of herbs and spices to boost flavour so you don’t need to use a lot of salt. 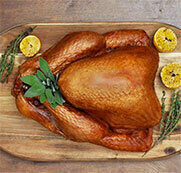 It’s simple, make your own using turkey parts or a leftover turkey carcass. There are several recipes in the Canadian Turkey Soup Section that feature homemade stock. Step 2. Add turkey, the power protein! Adding turkey to your soup will keep you feeling energized and satisfied for longer; turkey is packed with protein, which boosts satiety (meal satisfaction). Step 3. Top up your soup with lots of vegetables. I like my turkey soup with lots of vegetables; at least half my bowl is filled with little chunks of sweet potato, pieces of leafy greens, or broccoli bits. Vegetables give you a huge variety of vitamins, minerals and antioxidants that protect your health. Veggies are low in calories and high in fibre to keep you feeling full; add that to the turkey’s protein, and you’ve got one super satisfying meal! The produce possibilities here are endless; any vegetable pairs perfectly with turkey. How about bokchoy, butternut squash, carrots, spinach, broccoli – you name it, let’s add it! Step 4. Stir in some quality carbs! Carbohydrates are your body’s main source of energy but some carbs are definitely better than others! I recommend quality carbs such as whole grains, starchy veggies, or pulses. These carbs also come with fibre and valuable nutrients such as phytochemicals (natural plant compounds).